A photo of a pregnant working mom is going viral for its incredible depiction of multitasking. Dr. Megan Meier is a sports and dance medicine physician in Oklahoma City, Oklahoma. 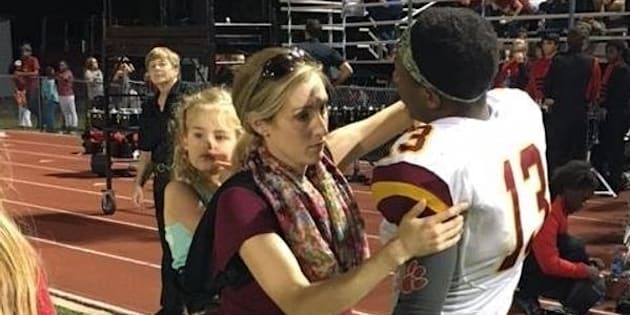 In September, she attained internet fame for a photo that shows her caring for a football player on the Putnam City North High School team ― all while visibly pregnant and wearing her toddler on her back. Meier explained on her Facebook page that she posted the photo in a group for physician moms. “I thought they would enjoy it ― seeing a visual representation of what we all do each and every day,” she wrote. Responding to the overwhelming attention her photo received, Meier expressed her gratitude for the support and kind messages on Facebook. Thanking her family, friends, colleagues, patients and the Physician Mom Group (PMG) she joined on Facebook, she added, “Most importantly, it takes a strong community of people supporting each other to make it work.